While I already have a planner for work, and the iPad keeps my days coordinated as well, I love having something with me to write down quick notes and things. It makes no sense unless you're a paper junkie, and Ecosystem very kindly supplied me with a fantastic Grape fix. This picture of the 2011 Ecosystem Planner doesn't really capture the beautiful dark grape outside color, something very similar to a cross between J. Herbin's Violette Pensee and Bleu Nuit inks. Its flexible (which I've gotten to like) and has a very thick cotton elastic band to keep it closed. The medium-sized Planner is 8.25 by 5.25 and pretty thin, so it's not too bulky to fit in my bag. Inside is a cotton, non-elastic band for keeping track of the current week. Both are 100% organic cotton, with 100% Post-Consumer Recycled Paper, while the cover is dyed with vegetable-based ink. Green Grape, as it were. After all that, we finally get to the weekly calendar, as pictured above. 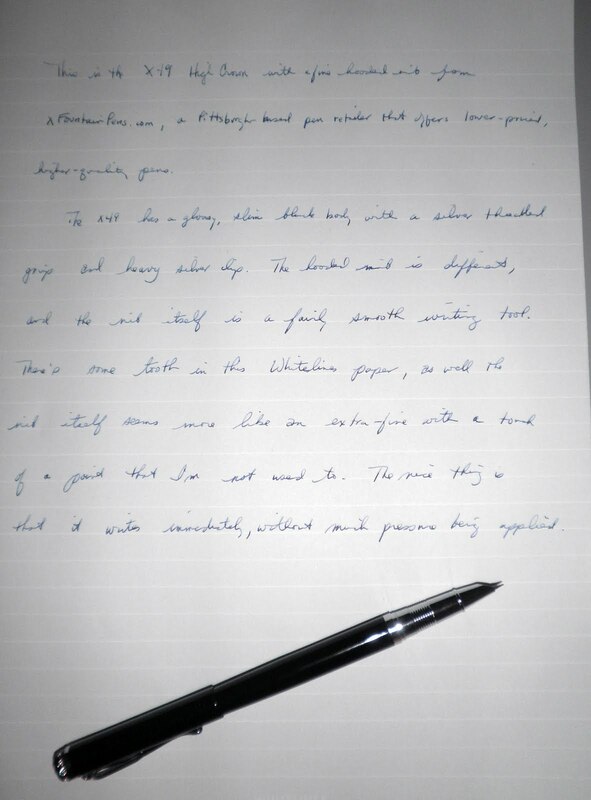 The paper is really very good quality, and I actually had to wait for my fountain pen ink to dry to close the journal. That's what makes this such a pleasure to write on. This is a shot of the web site log page, which is very handy. I'm not sure how I'll feel when I have to copy all that over to another planner, but maybe I won't have to. Which leads to an interesting observation: there's no address book in this planner, something I find refreshing. I always hate the waste of paper in my Day Timer, and am really glad Ecosystem didn't bother with that function. And like the other Ecosystem paper products, this one has an envelope at the back for receipts, notes, whatever, and an ID number in case you want to log it in at the web site. All in all, from color to paper to use the Ecosystem Planner is exceptional. If you haven't gotten one yet, they likely will be available at Barnes and Noble (and possibly on sale, as well). Check this out if you're around, or on line. 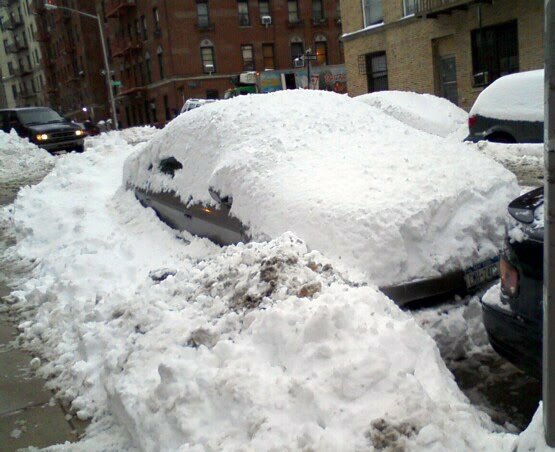 I'd say this guy will be stuck for some time, unless the thermometer hits 75 today and melts everything off and away from the car. Yes, I know it's January and all that. But we've had 60 and 70 degree weather in January the past few years as well. Using high quality paper such as the Rhodia and Clairefontaine leads to the problem of longer drying time because of the clay coating. 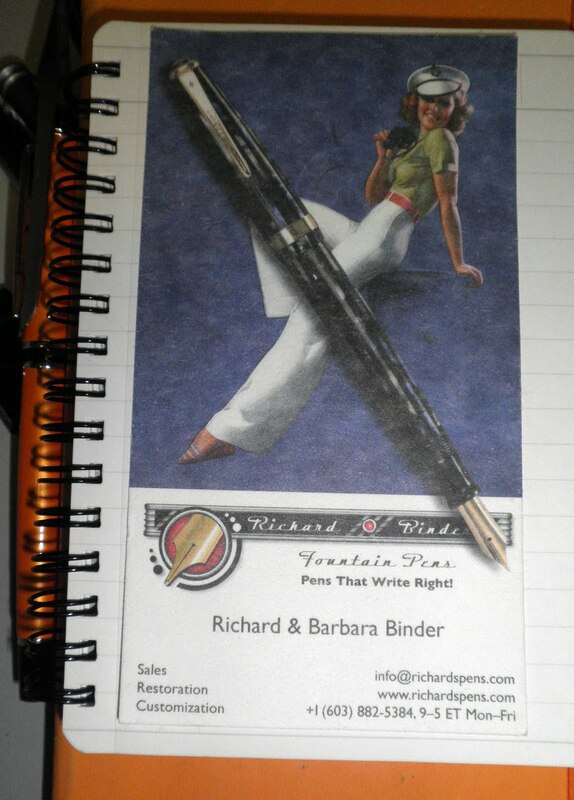 As I was waiting for the ink to dry before closing my notebook I remembered that one of the pieces of paper that came with my Waterman 92V was an advertising blotter that Richard Binder sells in packs of five for $4. Rummaging around I found it and pressed gently against the page, and was really gratified and a bit surprised to see it had worked. Surprised because the ink left on the page was two shades lighter than what I'd written. That is a lot of ink, but these blotter cards are large and re-usable so there should be no more problems with smudging. I've gotten to like pressing this against the page, there's something satisfyingly tactile about writing with a fountain pen and then blotting the paper. The advertising blotters are made from 100-pound heavyweight blotter stock, which has a nice rough feel to it, and the five pin-ups are wonderfully retro. 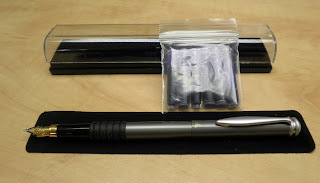 Nice review of the Noodler's Flex fountain pen, the clear demonstrator, over at BengKia's Cave. And the makeup case-into-pen-holder is a great post too. OHTO is another brand featured at JetPens that I've been curious to try, but hadn't hit the "add to shopping cart" button until a recent order. 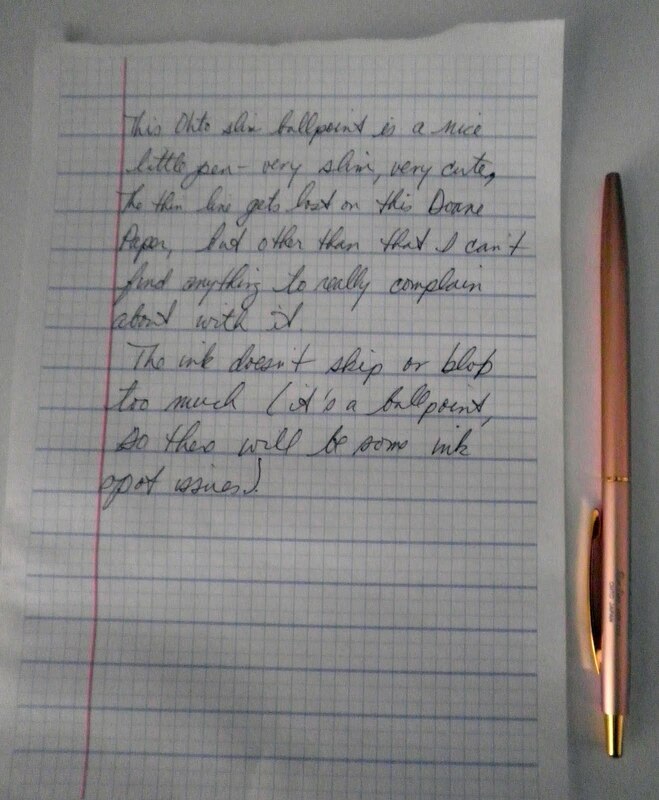 As I was looking for a ballpoint at the time, I decided to try the orange Needle-Point Slim Line II Ballpoint Pen with a 0.5mm tip and orange body. According to their website, OHTO manufactured the world's first pencil-shaped ballpoint pen in 1949. The Slim Line is a soft ink roller pen, with an aluminum body and brass accents. It is tiny (5.16 inches, with a very small refill about the size of a darning needle) and slim (9.5mm diameter), and the needle point is so slim it seems to disappear when you are writing. The Slim Line is a delicate-looking pen but has held up well in a pencil case tumbled around with bigger, bulkier pens. No scratches on the body so far, even when I've just dumped it into my satchel next to the keys and phone. The ink is actually quite good, not a lot of blobbing on the Doane paper (although the thin line seems to disappear next to all the lines and colors) and no skipping. If you need a pen that can fit into the tiniest of pen loops, or the smallest of pockets or purses, this is it. Lots of fashionable colors to chose from, in an assortment of pastels and bolds that either hide away or make a statement. The New York Times just published an article about a Virginia psychiatrist who altered the date of a pardon Abraham Lincoln granted to a Union soldier for desertion. The change make it seem that this was one of the last acts of the President's life. “He indicated that he snuck a pen in — a Pelikan pen — and he marked the document and changed the date for the simple reason of getting some notoriety,” said Mitchell Yockelson, an investigator for the National Archives. So if you're going to alter historical records, keep in mind that the official pen seems to be a Pelikan. Had to be a fountain pen, but which one? I'm thinking something weighty, like the Souveran M800 in Blue o' Blue. I'm sure the company is honored. I like the way Tradio pens look and write, especially the EnerGel, so I decided to add a black Tradio Pulaman to my fountain pen collection. The fountain pen features an angled, flattened point on both sides of the tip so you can have thinner or thicker line widths as you change your grip and pressure on the point. I wouldn't call this a fountain pen, although "strange rollerball" doesn't work either. It's an interesting take on the gel ink/felt tip pen, and as it's refillable it's a keeper. Perhaps the best thing about Tradio pens is their design and color selection, while the pen part itself is just a fine writing cartridge. What I find interesting is that the refill itself is almost the entire Tradio Pulaman fountain pen (and Stylo, as well). The Tradio's cap and barrel are almost non-essential, you could just buy the refill, keep the clear cap (which is actually not that bad looking, style-wise), and use that as an efficient if different-looking gel ink pen. One eBay seller I've gone back to several times is temecula53, who handles a lot of medium and lower-priced ballpoints and fountain pens, such as the Rotring Surf. Looking through his gallery I came across this Crown fountain pen in grey by Terzetti, a brand I'm not familiar with but was definitely interested in from the pictures. This is an excellent fountain pen with a sleek, contemporary design and a medium German iridium nib that doesn't skip or dry-start (so far, I should add). The glossy grey barrel is complemented by matte chrome trim and accents and a softly rounded clip. There's also a black hard rubber grip near the section that really adds a nice touch to the overall look of the pen. The cap has a jewel-like matte chrome crown and an indent that matches the indent on the end of the barrel and acts as a lock when the cap is posted. All of this hardware makes the pen slightly heavier than most fountain pens, but that's one of its attractions. 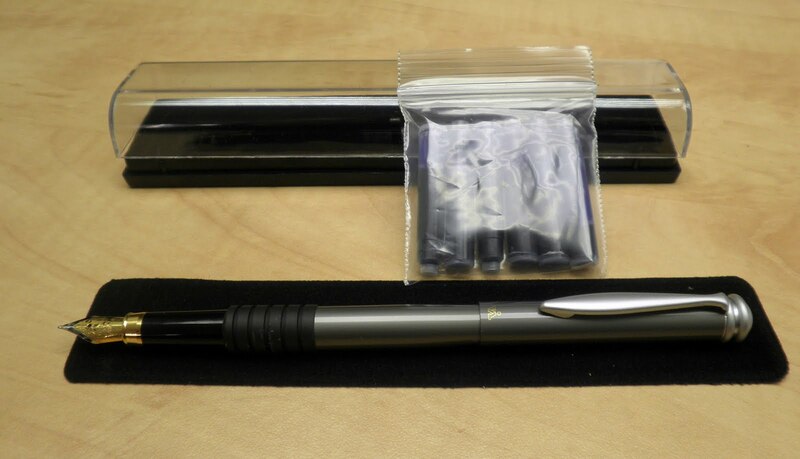 The pen also comes in a white version, and you get a great package: pen, 5 ink cartridges, a converter, a velvet pouch, and a clear case for storage. For $14 total (which includes shipping), you really want to think about treating yourself and adding one of these to your collection. Art Brown is showing off five limited edition De Atramentis inks that have just arrived, only 250 of each bottle are being produced and sell for $20 for 28ml (one ounce-ouch). From left to right: South Sea Blue, Australia Red, Tropic Green, Africa Brown, North Gray. Larger pics at the website but no swabs. Target carries a lot of great office supplies and many Post-it products, including this Post-it Personal Journal. Made out of a fairly thick cardboard stock, this holder contains two 4x6 inch 50-count Post-it pad for all your note taking needs, including a 7-day to do list and a regular lined pad. Semi-pocket sized, it's just a little wider than a Moleskine or Rhodia pocket notebook and so may not be useful for everyone. The sides fits smoothly when closed, so there's no room to slide in a pen or pencil (a Tombow OnBook clip ballpoint will work, however). And the elastic closure band needs to be a bit more robust (i.e., not a cheap hair scrunchy). Finally, color selection could be better: there were blue Greek coffee shop style patterns and red Animal print-style patterns, but no solid black for the serious or business minded. If you're looking for something to carry Post-it notes that's refillable and handy, this is a great choice. Finding it may be a bit challenging, as I didn't see it listed on the Post-it website. So you may have to check out a few places, but for $7.99 it's a handy way to carry your Post-its for quick notes and lists. With a bit of re-tooling (size is okay, color needs some work), this could be a fantastic and fun "productivity tool." While looking for something a bit different to round out a JetPens order, this Morning Glory Mach II gel ink pen seemed like an interesting addition. From Korea, the Mach II is a 0.4mm needle point with a tank ink cartridge that will last and last (5,000 meters per the advertising). As I've never actually measured any writing, I'll take their word for it. The Mach II design is pleasingly color-coordinated, with a semi-transparent barrel accented by a lighter, slightly metallic opaque cap and end. The 0.4mm needle point tip gives a precise, thing line but it's just wide enough to suit me. The ink seems to shade a lot, and then lightens as it dries. Drying time is fast, so there's no smearing, and the clip is solid without being too heavy. It's a very good pen, and should get a look-see if you're placing an order. James Carville made the observation that if he could reincarnate he'd want to come back as the bond market, as its power scares everyone. But really, without pens there would be no bond market, or anything else for that matter. Look at the Massachusetts Supreme Judicial Court's recent Ibanez ruling on who owns the mortgage and note in order to foreclose--the houses go back to the foreclosed owners because, in part, some of the paperwork wasn't signed and stamped! Jeez, how much does a BIC cost? We're not talking a 1943 Parker Vacumatic 1st Quarter, you know, just a few ballpoints or gel inks from JetPens would do. If you're signing several hundred forms a day, committing perjury for which the rest of us mere mortals would do some jail time with fines, then I'd recommend a good gel ink pen that's both functional and attractive. Something like the Pilot Choose Gel Ink Pen with a large 0.7mm tip, for a readable (if not entirely legal) signature. 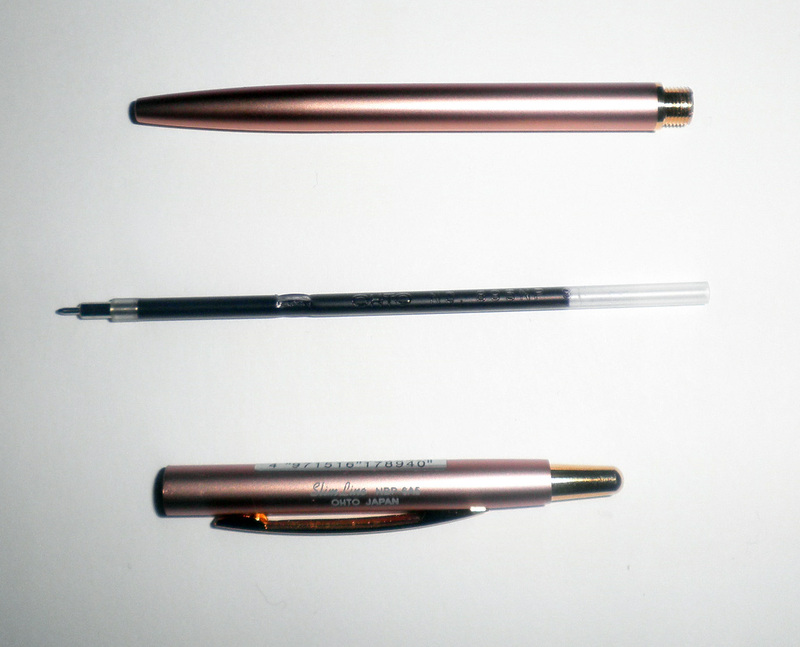 The Pilot Choose, which resembles the Uniball UM-100, is 74% recycled plastic and comes in a variety of colors including Blue-Black and Violet (the two pictured above). The 0.7mm Choose line includes the colors silver, white, and gold. Between the two tip sizes and the colors, there are lots of choices for this $1.50 pen if you're looking to add to your collection or just have thousands of documents to sign. Pros: it's a very good-looking pen, with a pleasingly-rounded clear barrel so you can see the ink reserve. Writes smoothly, has a great hand-feel to it, and it's an overall nice pen. 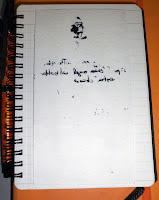 No bleed through on the paper or heavy shadow, but I was using an Exaclair notebook with it's exceptionally good paper. Cons: sometimes the ink doesn't flow evenly, and the middle of the line is thin while the outsides are thicker. 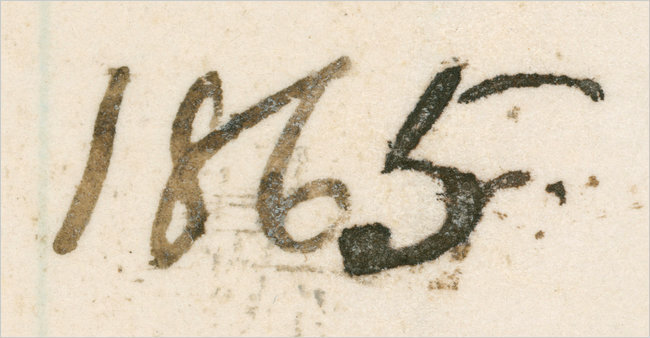 This may be caused by an un-even tip, or the ink itself may not be correct. It's actually minor, but I did notice it on a few words. Overall, a good pen to include in your rotation, although the cap is stocky and needs some extra space. If you're rounding out a JetPens order, definitely think of including this. ...I'd have two gold medal winners in my house. Next to this, we're all just amateurs. This amazing fountain pen was my brother's Christmas gift to me, and my mouth still drops open when I think about it. He remembered my mentioning the Philadelphia Pen Show to him last Christmas, and then telling him about the Waterman pens I picked up at the October 2010 NYC Pen Show . So he went online and found a vintage pen seller, someone by the name of (wait for it)...Richard Binder. Did I know anything about him? After picking my jaw up from the floor I grabbed some paper and the bottle of ink my brother also thought to buy with the pen ('cause I don't carry any when I'm traveling) and filled my new tyke up. This green and red Waterman 92V is a vest pocket pen that was made sometime in the late 1930s. It's 4,5 inches in length when capped (tiny! ), and meant to fit in a gentleman's pocket for jotting quick notes. It has a 14k #2 nib, a very flexible fine point which my brother said had been worked on in some way by Richard Binder (bro doesn't quite remember what the specifics were, I may have to email to find out). This is definitely a flexy nib, my only problem with it is that it seems to be a very dry writer. I'm using the EVERFLO ink, but will switch over to Noodler's or maybe the Chesterfield/Diamine archival inks. Noodler's tends to be very wet in most of my pens, the archival inks would be similar to what was originally in this Waterman. It's a beautiful pen, writes very well, and it's so small I have to be careful not to lose it. The perfect colors for Christmas as well. 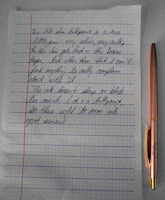 One interesting note: I had my Sheaffer Slender Balance fountain pen with me and my brother really liked it. So much so that he went online and found one at an auction site that he immediately bought. He also mentioned that the seller had some really nice Esterbrooks available, then stopped himself saying that buying these fountain pens could become really addictive. Could be, lol. Besides a 60 pound piece of amethyst geode, I've also acquired a dragon for my home office. 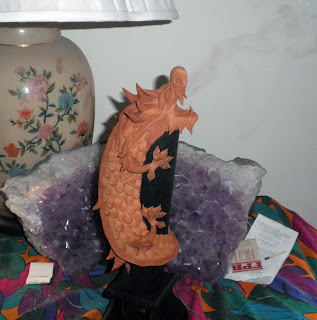 Sculpted in Thailand from sawdust and glue, the dragon sits on the side of a black wooden hollow pillar--it's actually an incense burner. The bottom detaches and you can put stick incense in the pillar, so that smoke comes out of the mouth (which you can see a little bit on the right top side). A recent purchase was this X49 High Crown Hooded Fountain Pen from xFountainPens, a Pittsburgh-based retailer that offers lower-priced, high-quality fountain pens and Chesterfield inks. I like browsing this particular website, while not all of the pens are to my taste there are some I am interested in, and the prices are very low with free shipping for orders of $15 and over. This particular pen caught my eye due to the hooded nib, and so I placed an order for this and some of the Chestefield ink. The X49 has a slim profile, and has a glossy black lacquer over metal barrel with silver accents and a jeweled cap. The nib is a fine point, but to me it seems like an extra fine that's how thin the line width looks. I seem to be applying too much pressure to the pen so it's dragging a bit over the Whitelines paper, which does has a touch of tooth to it as well. When I put nib to paper and gently press down, it writes perfectly. I think I've been writing a bit too much with vintage flex nibs, and will have to work on my grip with this one. The silver accents are impressive, with a very heavy silver clip and grooved grip area. Uncapped the pen is quite light, but add the cap (and clip) and it's much heavier in the hand. I didn't care for the sparkly cap jewels at first, but now I hardly notice them as they are slightly recessed and seem to become invisible over time. The X49 pen can take cartridges or a converter, which is included, and the price is an amazingly low $9.99. Add some ink and you've got a sweet deal from xFountainPens. If you like hooded nibs with fine/extra-fine points, or inexpensive pens that write well and look good, then you may want to check this out. 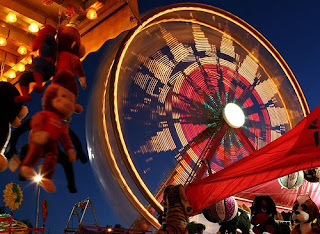 The Carnival of Pen, Pencil and Paper is a monthly traveling blog carnival that highlights the past month's best reviews, posts, pictures, musings, and raves about pens, pencils, journals, notebooks, paper, and the other paraphernalia that make life worth scribbling about. 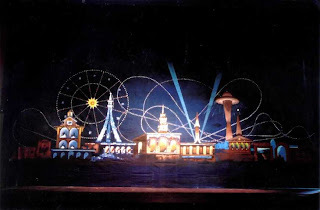 Founded by Nifty of Notebook Stories, this January 2011 edition (which I'm very pleased to host) is the 18th in the series. You can find past, present, and future Carnival information and submission guidelines here. And a big thank you to C., my co-worker and fellow fountain pen collector, for making the January banner. I loved Amy's review of the Platinum Carbon Desk Fountain Pen at The Pen Addict, definitely check it out. Margana at Inkophile has a great post on the ink blotter, definitely a dirty little secret in more ways than one. Great writing is partly the pen, partly the hand holding it, and partly the blotting process, as she shows in this post. While I've heard of Retro 51 I can't say I've used any of their pens, but OfficeSupplyGeek has a review of their Tornado Deluxe Bamboo Rollerball Pen (and what a cute Panda engraving!). Brian at Goulet Pens gives the new Noodler's Flex Nib fountain pen a pretty thorough work out, using the instant-classic ink Black Swan in Australian Roses. From PencilWrap we have a bevy of Bic Markers (go for the review, stay for the really nice handwriting). Lady Dandelion shows off 11 italics in her collection as well as more beautiful handwriting, and makes a number of very good points about the way we write with different nibs (my Parker Latitude stubby italic slows me down, while my EF and F "plain" nibs speed me up and make my writing...interesting). Bleubug found this Lady Dandelion post on nib width just as intriguing: "I like this post because it reminds us of the different width's strengths and has some nice comparison shots. " Definitely! Here's a great post from Alex at EconomyPens on a stunning duo: the Lamy Safari with a 1.1mm calligraphy nib and Noodler's La Couleur Royal ink. Seize the Dave also does a quick test drive of the Noodler's flex fountain pen and the Black Swan in Australian Roses ink (Dave's script is amazingly beautiful as always). And check out his review of Diamine's Monaco Red (that is a beautiful color). 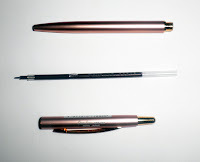 Cheryl at Writer's Bloc did a really great review of the STAEDTLER pen's Dry Safe feature, putting triplus pens (one of my favorites) to the test. Snarky's Machine over at Does This Pen Write? reviews the EXECUTIVE STYLE 4-in-1 pen. Julie as Whatever reviews these awesome Quiver Pen Holders, they look incredible and are stylish as well. And then there's her review of the new Edison Mina pens--wow (and a hat's off to Brian at Edison Pen Co. as well)! 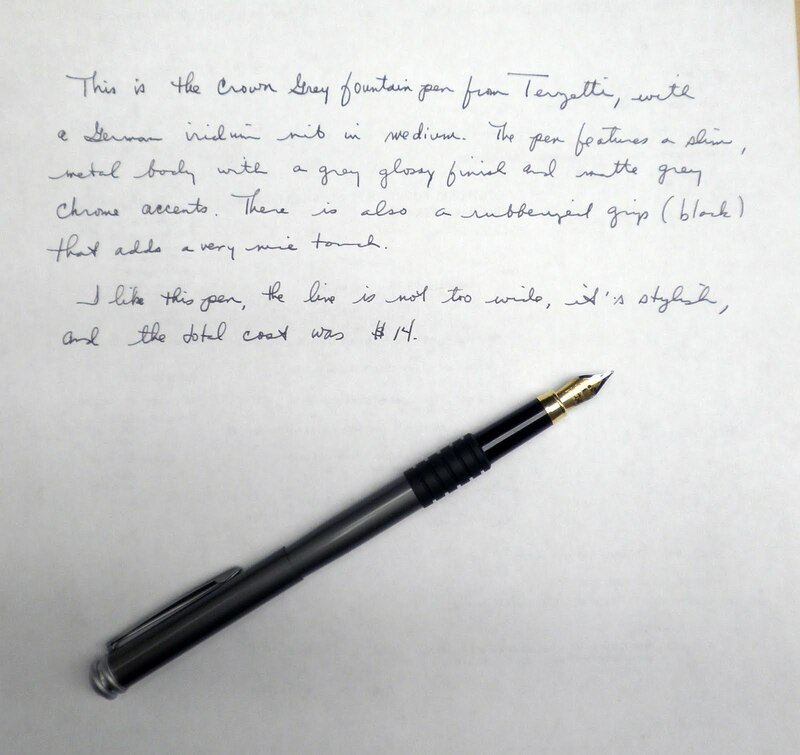 Keith at Penned House reviews the Parker 51, in this case a pen owned by one of his grandparents and still in excellent condition (his grandmother was a fountain pen saleslady in a Singapore department store--now there's some history). And check out his search for suitable stationery. Writing and Scribbling reviews J. Herbin's reddish-brown Terre de Feu ink, and do take a look at the link to Waterman Havana in the post. There's also a visit to Paper-Papier, giving a nice review of the store and it's many wares (including some awesome store bags). Finally, Lito Apostolakou sent in this post from Palimpsest on Alizarine Ink with recipe and famous author (Nietzsche) included. There's also a recipe for Ink Cocktails, so do stop by and take a look. Scription shows off the Ain Stein pencil lead (the punch line for the name is in the second paragraph, love it!). 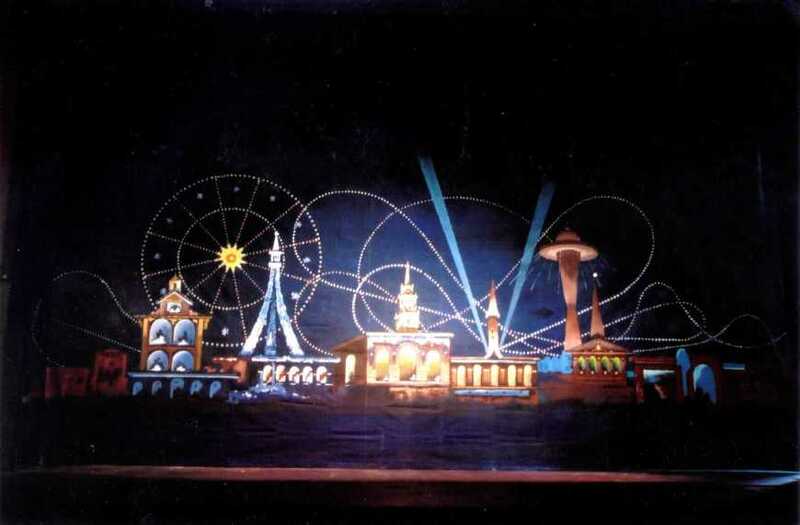 Then head over to Dave's Mechanical Pencils for a longer review. I've been following the re-launch of the Blackwing pencil, and thought I'd just post this blog for anyone interested in Palomino's effort. Why keep a journal? 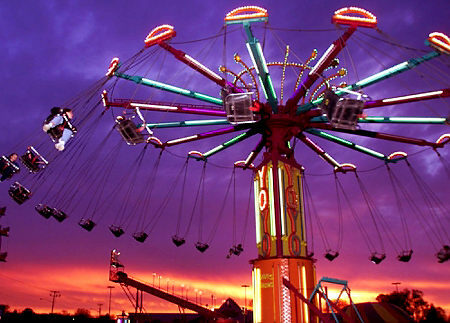 Well, Snarky's Machine has a list of 10 reason's why you'll be cooler if you do. Zequenz Notebooks, which are as flexible as kittens but easier to write on, gets a great post at Journaling Arts. Lauren, formerly of Pennington-on-Paper, has a new blog (unhalfbricking) and an introspective post on journaling that's a lovely read. Katie of Orange Circle Studio sent in this introduction to the new Edgewise Journals. Derek submitted a lot of great reviews, so I'm giving him his own set up on the Carnival midway. I love to read lists of favorites (it's like looking over someone's shoulder as they read or write), and Inkophile's Favorites for 2010 was no exception. Brad at The Pen Addict has his Top 10 Pen Reviews posted, definitely a must read before heading out to Staples or Office Depot (or wherever you buy your supplies). Another Best of 2010 list is from Dave's Mechanical Pencils. From the OfficeSupplyGeek is a Top 10 Office Supply Reviews List (number 1 is and isn't a surprise). And here's the 2010 list from Inkyjournal with some great pics. Finally, here's Heather at A Penchant for Paper, her 2010 list includes one of my favorite journals--the new Rhodia unlined webbie. Bleubug guest blogs at Rhodia Drive with a post about marks on paper (watermarks, wax and stamps, seals). I know how TAO feels, I love the marks on those green and white rectangles, the one with the funny $ signs and pictures, and the pyramid with the eye. Personal Cents on Saving Money at the Grocery Store. Erica and her 50 Best Free E-Books for Your Business Education from Online Marketing Degree. 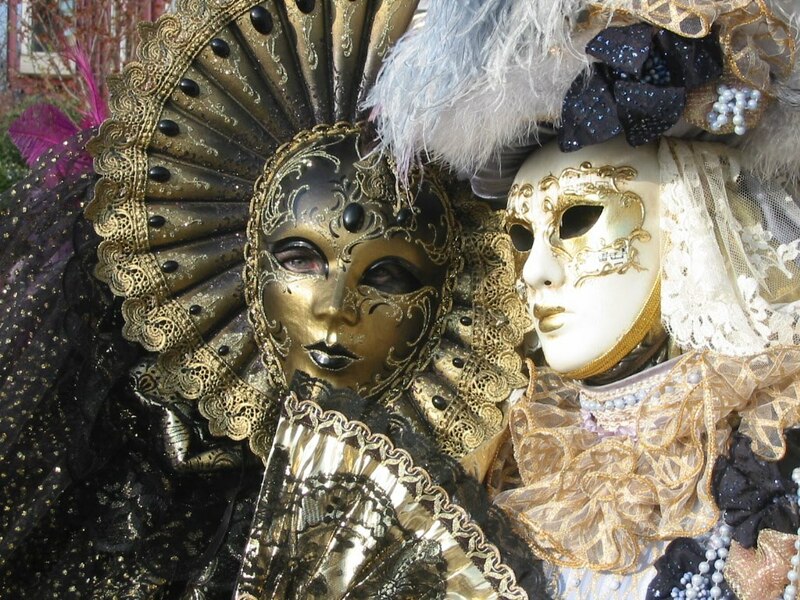 Andrew's post at his ComboInk Blog about inkjet cartridges for your printer. One of the websites I visit is xFountainPens.com, a Pittsburgh-based retailer with good-quality, low-priced pens. They are the only place I've come across that has Chesterfield ink, which has gotten some positive posts over at the FountainPenNetwork (especially the browns, Sepia and Mahogany). I recently placed an or der for one of their pens and decided to try out the Chesterfield Archival Vault permanent ink, which like Diamine Registrar's Ink is said to be the exact same formula as used in the United Kingdom to record demographic data (births, deaths, marriages). Like Diamine, it starts out blue and oxidizes to black, in this case more of a dark blue black. And it is waterproof and permanent, of which I can only test the former (but will ask my heirs to blog about the latter in seventy-five to a hundred years from now, so stick around). Diamine Registrar's Ink is an iron gall-based formula, which can damage a pen without regular cleaning. There's no mention of that on the xFountainPen website, but according to a great review by fiberdrunk at FPN the Archival Vault is made by Diamine for Chesterfield, and is the same iron gall formula as Registrar's Ink. The two inks may be identical in most ways (waterproof, permanent, blue-to-black-oxidation) they are distinct in one particular way: color. In the picture at the top, the upper right corner compares Diamine on the left to Chesterfield on the right. The Diamine fades to black with a distinct blue-green undertone, while the Chesterfield is a truer black-blue color. I like both inks and wouldn't recommend one over the other based on the color, but I would do so based on price and amount. The Chesterfield is 50ml for $9.99 while the Diamine is 30ml for about $15 (the glass bottle of the Registrar's Ink may make an aesthetic difference but the illustration of the horse and carriage on the Chesterfield "plastic" bottle goes a long way towards alleviating that little detail). And xFountainPens offers free shipping on orders of $15 or more, so two bottles of ink or one of the lower-priced pens will get you into that territory. As you can see, the ink is definitely waterproof. 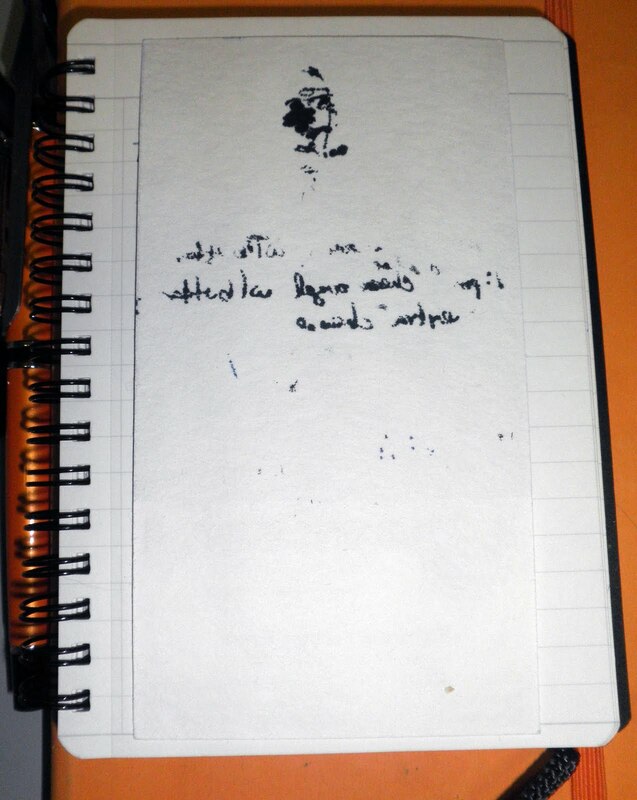 I had it under the faucet, running my fingers over it, and there was a small amount of ink loss that tinged the paper a pale-deep blue but nothing you would really notice regarding the writing. I like this Chesterfield Archival Vault, it fits my template of what a true blue-black ink should look like. If you're interested in archival quality, waterproof ink made by Diamine for Chesterfield and sold at a reduced price, definitely give this a try.